The departure of David Bernstein and Lord King from the Aston Villa board was triggered by a bitter fall-out with the club's owner Randy Lerner. Bernstein and King wrote to Villa chairman Steve Hollis on Monday, tendering their resignations with immediate effect. It can now be revealed that their decisions were the result of a highly unpleasant exchange with Lerner. After joining Villa in March and February respectively, Bernstein and King grew increasingly frustrated at the lack of progress they were able to make. This came to a head when email communication between the pair, which included criticism of Lerner, was leaked to the US businessman. Lerner responded with an email of his own that featured a stinging rebuke to Bernstein and King, which they felt left their positions untenable. The incident was hinted at in King's resignation letter, which he started by telling Hollis: "You will be aware of recent communications between the owner of Aston Villa and members of the Football Board. "Following these, I am sure you will understand that it is with real sorrow that I am writing to tender my resignation as a director of Aston Villa Football Club Ltd with immediate effect. "I do not take this course of action lightly. As a supporter for over 55 years, how could I?" Bernstein and King were stunned by the content and tone of Lerner's email - especially lifelong Villa fan King, given he has known the American since his takeover in 2006. Despite their dissatisfaction, it is likely Bernstein and King would have stayed at Villa until Lerner had fulfilled his aim of selling the club. But the hostile interaction created a rift that could not be repaired. King, a former Governor of the Bank of England, added: "It is no longer possible to carry out the role that I was asked to perform. When you [Hollis], David Bernstein and I were asked join the board, we were able to make a start. But progress has stalled." Bernstein's resignation letter said: "I was invited on to the board to oversee a much needed review of the football side of the club including all aspects of operations at Bodymoor Heath. 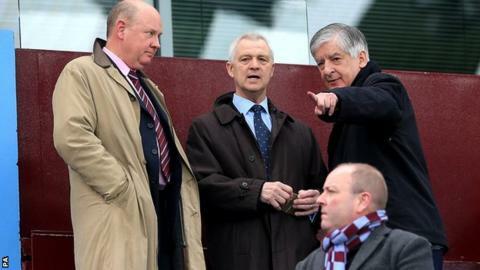 "Following this I was to lead the implementation of this review and the ongoing management of football at Aston Villa. To this end a football board was created consisting of four people with considerable football and relevant experience. For this new structure to work it required all at the club to accept new disciplines, clear reporting lines and to adhere to the authority delegated to the new football board. "Unfortunately it has proved impossible to implement the agreed structure and my position has quickly become untenable. The issues at the club are fundamental and the solutions are radical and do not lend themselves to compromise." It is understood that Bernstein and King came into Villa expecting a far greater level of authority and autonomy than they ultimately received. Their initial communication with Lerner was positive, but that changed when they set about implementing their plans and it is not clear whether the owner was ever fully aware of the exact brief agreed between them and Hollis. The newly formed football board - comprising Bernstein, King, former Villa player and manager Brian Little and ex-Football Association executive Adrian Bevington - never actually held a meeting or discussion as a group. Little, who arrived on the same day as former FA and Manchester City chairman Bernstein, remains in his role as an advisor to the board. Bevington is thought to be deliberating over whether to continue his work with the club, who were relegated from the Premier League with defeat at Manchester United last Saturday. Before Bernstein and King left, they presented Hollis with a shortlist of candidates to succeed Remi Garde as manager following his sacking on 29 March. That consisted of four names, as well as two back-up options. Villa say the managerial search "remains a priority", while Hollis is "currently engaged in extensive negotiations in relation to the sale of the club".